Once construction for homes, a hotel and other infrastructure was underway, the RIC realized a place of worship was needed for those visiting on weekends from Chicago. For this, Olmsted chose the corner of Barrypoint and Scottswood Roads for a church, although the location was serving as a cemetery known as Flat Creek Cemetery. The site was cleared and the cemetery was relocated to Wolf and Joliet Roads. 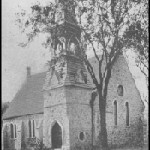 In 1869, a small church of uncut limestone and a slate roof providing seating capacity for 300 was built and named “Stone Chapel.” This non-denominational “Union” church hosted Presbyterians, Episcopalians and other protestant church groups taking turns arranging for Sunday services. On the verge of financial ruin, the RIC was forced to mortgage the Stone Chapel. Presbyterians began meeting in the Refectory Building at the Riverside Hotel while the Episcopalians rented the church. 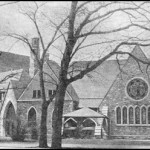 In 1872, arrangements were made for the Presbyterians to take over the Stone Chapel. Fifteen members entered into a covenant under the name of Presbyterian Church of Riverside and gained admission into the Presbytery of Chicago. Presbyterian Church of Riverside is the first church entered on the Cook County books after the Great Chicago Fire of 1871. The first acting pastor, Rev. Trowbridge, was paid $750 for six months of service. Sunday School began in 1875 with a congregation of 48 members. In 1878, the church bought the Stone Chapel from the mortgage holders for $2,500, most of which was contributed by church members. Months later, in 1879, a fire broke out during Sunday Services due to a defective flue. The building burned almost to the ground. Only a few sections of wall remained standing, including the tower entrance. An architect was hired immediately and the church was rebuilt in the Gothic style. Workmen were able to use most of the stone from the original chapel. The newly built church was completed in 1880, with seating that faced south. Rev. Trowbridge served as acting pastor for 14 years until 1885. In 1888, Rev. Sneed joined the church and Professor and Mrs. A.F. Ames became members. Prof. Ames was the first Superintendent of Schools and he and Mrs. Ames were valued members as they served actively for many years. The Ames family has been members for 4 generations — Prof. Ames’ daughter, Harriet Ames Carlson, was a member for 84 years. Her daughter, Harriet C. Kweton (wife of the late Elmer Kweton) has been a member for her entire life. In 1879, the church parlors were added to the south of the sanctuary to accommodate Sunday School Services at a cost of $3,000. The Ladies Aid Society contributed $500 to the Building Fund and also furnished the Parlors. In 1892, Rev. C.C. Snyder was hired for a salary of $1,800. He arranged to supervise the Sunday School of Bethel Chapel across the river in Lyons. Superintendent Ames and other teachers walked across the river each week to teach Sunday School at both churches. Rev. Snyder was very interested in his parishioners and often visited them at home. He reported to the Session that a member was drunk during his home visit. Consequently, the member was asked to appear before the Session but failed several times to respond, so was voted to be dismissed by the church. 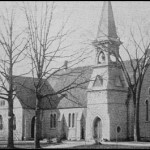 In 1896, the congregation had grown to 177 and expansion was necessary. Riverside architect, Charles Whittlesey, altered the shape and size of the sanctuary. The original plan placed the organ and pulpit on the south wall. The new plan called for custom-made curved pews facing the west wall, the way it remains today. Seating for 400 and the manse was added. Ladies Aid Society donated $1000 of the $1,200 construction cost. In 1923, membership stood at 361 and the mortgage (from additions) was almost eliminated. This urgent appeal brought results: 35 women met and formed the Northgate Woman’s Society. 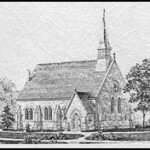 They contributed generously to the church, aided the Sunday School, donated funds for Bibles, paid taxes each year on the church lots, and more. Unfortunately, the Great Depression hit and changed the economic situation. The Trustees realized the community could not finance the proposed church building on Nuttall and sold the lots in 1938. At that time it was decided to hold the North Gate Sunday School at RPC. The last A.F. Ames School service was June 1938. Construction of the new Community House caused the church to suffer terrible debt, with over $38,000 in unpaid bonds and notes. A “Debt Retirement Fund” was started and over $25,000 was raised. Rev. Waldo retired in 1937 with 24 years of ministry service to RPC increasing the membership from 193 to 608 during his tenure. In 1950, there was a record high membership of 1,124. In 1964, another devastating fire broke out in the foyer of the Community House and spread mostly up the open wood staircases of that building causing $250,000 in damage. The 36 year-old south wing was gutted but the historic stone sanctuary was saved. The congregation voted for an architecturally modern building, not the 1928 plan. Riverside Presbyterian Church celebrated 100 years in 1972, with 819 members. In 1981, an Endowment Fund was created with a $20,000 donation given by an anonymous member. This Fund allowed the Church a steady flow of money. The Church dream was to have $1,000,000 by the year 2000, although the dream never became a reality. RPC has been served by 23 ministers and has survived two World Wars, the Great Depression and two devastating fires. Join us for our second century in Riverside, Illinois!